If I had a penny for every time I walked into a public bathroom and found spots of urine on the toilet bowl lid, I would be a millionaire. Men are the main culprits and I really feel bad for women who have to deal with this in unisex bathrooms that only have a toilet bowl. 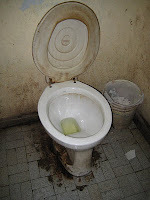 For guys using the toilet who only need to urinate, this is not a problem. For women though, there is really no choice but to wipe off someone else’s urine, squat above the bowl (but who wants to do that? ), or try to find another bathroom (not always an option, especially in emergencies). If a man needs to defecate, he will be in the same predicament. Sometimes, you will walk into a public bathroom and actually find one that looks relatively clean, although doing so often feels like you won the lottery after looking in a about eight consecutive stalls with urine covered toilets or bowls filled with brown water and/or feces. I don’t know if women have the same issues in their public bathrooms, but men’s public bathrooms can be absolute total nightmares to deal with. If you do happen to come across one of those rare clean looking public toilets, don’t be fooled because germs are likely still there that can be harmful. Don’t believe me? Don’t take my word for it. Scientists at the University of Florida’s College of Medicine recently tested public bathrooms for two months and in several restrooms found that there were so many organisms present that they could not even count them all. All sorts of things are present on these toilets from salmonella to e. coli. This is not because people are rubbing raw pieces of steak and chicken meat over toilet bowl seats but because people who have these bacteria in their system defecate in the toilet, wipe (hopefully), get the bacteria on their hand and then begin transferring it wherever they touch. That means the toilet seat, the flusher, the sink, the hands dryer, and the door handle on the way out. This is why you really should have a small hand sanitizing gel container with you so that you can clean yourself after you leave the bathroom. After all, what is the sense of washing your hands well and then getting contaminated by the door when leaving? I also highly suggest doing things to put a barrier between yourself and other people’s disgusting bathroom habits. If you have to sit on a public toilet, put down a layer or two of toilet paper. Drop some toilet paper in the bowl before you flush it so that you create some layer of protection between yourself and public toilet water being misted upwards onto your body. Open the water spigot and the door with your sleeve if you have one. Don’t touch the inner surfaces of sinks since they contain large areas of germs. Use paper towels instead of hand dryers. Try to only touch the towels and not the box that the towels are contained in. Your immune system will ultimately help you out most of the time anyway, which is why we have one, but these extra steps can help protect you even further.